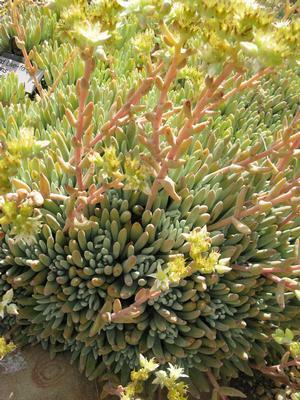 An evergreen succulent that's native to Catalina Island, California. 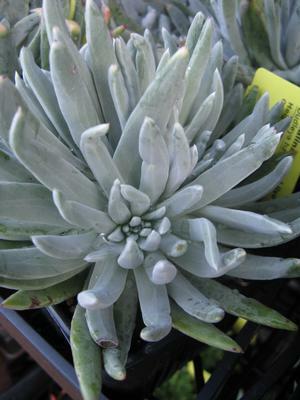 It forms small rosettes of chalky green fingers of foliage. Creamy-white flowers bloom on slender stalks about 8" long. Hardy to around 25°, maybe slightly lower on occasion. 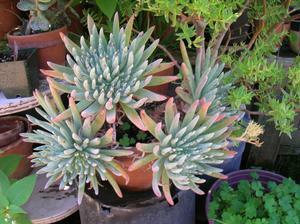 This native succulent is often referred to as Dudleya hassei, but its correct name is Dudleya virens var. hassei. The variety honors Hermann Edward Hasse (1836-1915), a botanist and medical doctor who studied California mosses and lichens in the late 19th and early 20th centuries.